This article addresses how to run two lights from one switch. 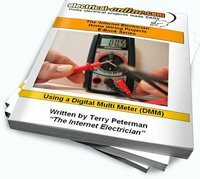 This common question comes from a do-it-yourselfer working on his garage wiring who required some assistance wiring a circuit in his garage so that he could control two lights with one switch. – Run a #14 -2 wire from the sub panel box to a device box for a plug receptacle, then to a light box (octagon box), and then to another light box (octagon box) and finally to another two device boxes for plug receptacles. NOTE: The picture is a thumbnail. To view it in full size – click on the diagram. This entry was posted in Wiring Projects and tagged box, circuit, circuit wiring, conductor, DIY wiring, do-it-yourself, garage wiring, ground wire, home electrical wiring diagram, house wiring diagram, light, light box, light fixture, octagon box, outlet, plug, receptacle, switch, terminals, wire, wire diagram, wiring, wiring diagram. Bookmark the permalink.